Buying a used car is like navigating a maze. And the car you’re after — at a great price — is in the center. Lurking around every corner are rip-offs masquerading as good deals. And it can be hard to make an informed decision with so many variables. Kelley Blue Book is a trusted resource. But as prices change over time and vary by location, it’s not a foolproof way of finding a car’s value. The last time my partner and I were in the market for a new car, we put together a spreadsheet to track prices and identify outliers. It doesn’t sound very exciting, but it was a game-changer for us. Use this Google Docs template to plot your two top variables against each other. For us, those are price and mileage. Generally, the cars we look at are of similar age and condition, so price and mileage are where you start to see differences. The spreadsheet makes a fancy graph for you, helping you to quickly pick out both good deals and bad deals as you’re shopping for cars. As you add entries to the spreadsheet, you’ll start to see a baseline for the average price. The real deals (both good and bad) will be the outliers on the graph, representing options that outpace the others in one or more areas (like price or mileage). The decent deals will fall somewhere in the middle of the graph, showing they are in line with similar options for sale. For reasons I still don’t fully understand, my husband had his heart set on a Mazda Miata. But not just any Miata — it had to come from a very specific window of time in the 1990s when the cars had pop-up headlights. So he began scouring the entire mid-Atlantic region for tiny sports cars with retractable headlights. As he came across listings that fit the (very specific) bill, he added them to the spreadsheet. We quickly realized the more cars we put into the spreadsheet, the more useful it became. My husband put in all of the Miatas in the year range that were in acceptable condition. If the car was in good enough shape to purchase, it went in the spreadsheet. If the quality wasn’t where we wanted it, we didn’t include the car. That way, we were holding that variable more or less stable by comparing cars that were in about the same shape. At this point, we weren’t even looking at mileage or price (which seems counter-intuitive but stick with me here!). Once we had a decent number of cars in the spreadsheet, we were able to figure out a ballpark median price. We didn’t want to go over $10,000 and were happy to find many options in our price range. Looking over the spreadsheet, we quickly spotted a handful of cars we wanted to check out — the outliers on our graph. My husband went out to test drive a few, and we kept filling in the spreadsheet and refining the median price. We also used the spreadsheet to make notes about each car and save the link to the listing. One day a black 1992 convertible showed up in Pennsylvania with just 36,000 miles. Our spreadsheet showed it as a crazy outlier for mileage (it’s a 24-year-old car!). Meanwhile, it fell pretty much in the middle of the pack for price. So we drove the three hours from where we live to check it out. My 6’2” husband was immediately in love with the tiny little convertible with pop-up headlights. And, thanks to our spreadsheet (and an inspection of course), we knew we were getting a good deal. For $9,000, we took it home with us. Now, a vintage roadster is in our parking spot and we’re members of the unofficial Mazda Miata club. It’s hilarious to watch how Miata drivers wink their retractable headlights to acknowledge one another on the road and how people wave to us as we drive by in our little car. 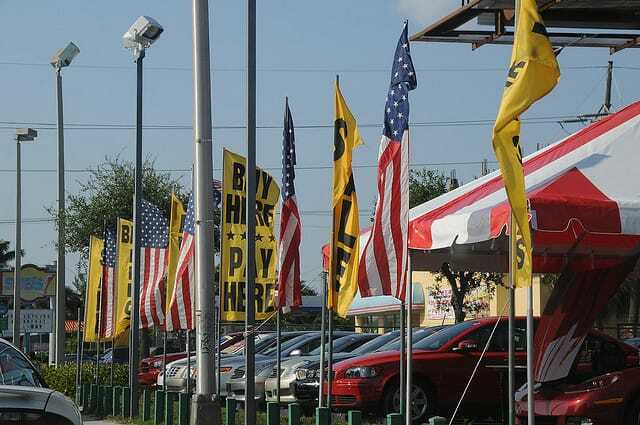 Your Turn: How do you comparison shop for used cars? Would you ever buy a 24-year-old convertible? Lyndsee Simpson is a writer and editor living in Washington, D.C. She does think pop-up headlights are pretty cute.